Since I make my living as a geek, I’ll occasionally share techie tricks that I use to make my life easier as a writer. Drop me a comment if there’s something specific you’re wondering about. I’ll help if I can. 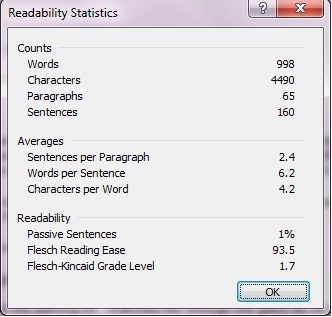 Microsoft Word calculates readability statistics based on the length and complexity of the sentences and words you use in your document. It doesn’t tell you anything about whether your writing is “good” or “bad”, but it can give you a hint if you’re making your readers work too hard. The Counts are self-explanatory (and you can find them more easily than by using this method). I’m assuming you know how to find your word count; if not, drop me a comment and I’ll do a post on it. The Averages are used in the formulas that calculate the three things that concern me most as a writer: reading ease, grade level, and passive sentences. The frequency of passive sentences is an interesting stat for fiction writers. All the “how-to” books warn against passive voice, and this is a handy-dandy way to see at a glance if you’re overdoing it. Reading Ease is based on a 100-point scale. The higher the score, the easier the document is to read. Grade Level is based on average reading levels in the U .S. school system. The readability score at the right is for my flash fiction piece “Freedom” (about 1000 words). It’s told from Dave the trucker’s point of view, and you’ll notice that sentences are short, readability is a whopping 93.5, and it’s written at a Grade 1.7 level. Dave is not a complicated guy. “Freedom, Too”, the companion piece told from Beth’s point of view, comes in at Grade 4.6. Another day, another 1000 words. Just for contrast, here’s the score for a technical piece that one of my clients requested, describing the ramifications of the Privacy Act here in Alberta. Trust me, you don’t want to have to wade through this puppy. Conventional wisdom states that for most writing, you should aim for minimum readability of 60 to 70, at a Grade 7 to 8 level. And yes, that includes non-fiction writers. Despite the complexity of his concepts, Albert Einstein’s papers still clocked in at about a Grade 8 reading level. First, you have to set Word to show the readability stats (this is a one-time thing). In Word 2010, click on the File tab and choose Options. Click Proofing (this will be a tab in 2003 and earlier, or a menu selection in the left pane for 2007 and 2010). Select the “Check grammar with spelling” checkbox. Select the “Show readability statistics” checkbox. Unfortunately, you do have to spell/grammar check the entire document before you get the stats. When the check is complete, the readability window pops up automatically. Hi I have just written 119 764 words in a crime fiction. It is my first book and is Grade level of 5.9 with readability of 78.2%. Do you think that it is OK to try and publish based on those stats? I wish it was as easy as running the readability stats and getting a simple yes or no answer! Unfortunately, MS Word’s idea of “readability” has absolutely no bearing on whether readers enjoy our work. From a technical standpoint, there’s nothing wrong with your stats. Your word count is a little high compared to the “norm” (such as it is) of 80K to 100K, so if you’re thinking of submitting to an agent, you may find they want you to pare it down a bit. Grade 5.9 is still quite reasonable. My novels usually come in around Grade 4.5, but I make a conscious effort to keep them there. If you want to see examples of that writing style, the links to the free PDF samples are here: https://blog.dianehenders.com/books/. If it’s your first novel and you’re wondering if it’s “ready”, I suggest you go to Janice Hardy’s blog at http://blog.janicehardy.com/ and read it top to bottom. The most difficult part of writing, particularly with your first novel, is to draw in your readers with internalizations, tightened points of view, and “showing not telling”. Janice does a wonderful job of explaining these concepts and many more, using real-life examples to illustrate her points. Hi Diane. Thanks for the piece on readability stats, which I use a lot. But I have question. Why is it that most of the time when I look at the stats, I notice only the a proportion of words have been “analysed” e.g. I have a 450 word piece in 8 paragraphs. 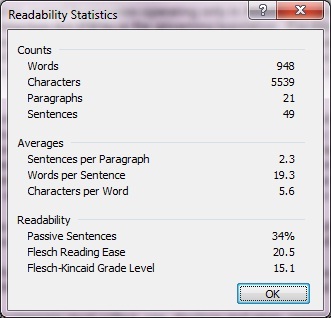 Run the spell check on the document and get the stats: 324 words, 4 paras! No matter where I put the cursor in the document, or if I highlight all the content and then run spell check, it doesn’t give me a complete read ( except perhaps for the very first read). What use is that when you’re trying to increase the readability of a piece through repeated edits? Any clues? The only thing I can think of is that part of the document might be set to Language (no proofing). Try selecting the entire document and then setting the language. I’m not familiar with the Mac version of Word, but in the PC version, you can find Set Language under the Review tab. Hope this helps! Thanks so much for the tips. I used this a lot time ago (some 7 years ago to be precise) and it comes back as I search for better ways to write. I hate that I can’t effectively convey a strong argument and find that I always go off topic. I love writing and I wish I could be a better writer. There’s no doubt that I’ve improved a great deal though. Coming to Canada for University was a great boon in this regard. Thanks for commenting – I’m glad you found this helpful.